There is currently a prescription painkiller epidemic that has a tight grip on the United States,and this is impacting people all over the country either directly or through somebody that they know. Painkiller addiction is highly dangerous with many health issues and it can also be difficult and dangerous to overcome. It is for this reason why knowledge is so important when it comes to painkiller addiction. So, if you or somebody that you know is currently battling with an addiction to prescription painkillers then read on for advice on how you can seek help and overcome this problem to start building towards a better life. First, it is worth establishing what the short and long-term effects of prescription painkiller abuse are. People can easily become addicted because they can become dependent on the drug both physically and psychologically. Short-term effects include nausea and vomiting, mental confusion, loss of motor function and dizziness. Long-term usage can lead to a wide range of physical and mental effects including paranoia, liver and/or kidney disease/failure, behavioral changes, cardiovascular problems, isolation from loved ones, damaged relationships, mood swings anda weakened immunity. Abuse can also be fatal via toxicity or overdose. Due to their addictive nature, opioids like OxyContin and Benzodiazepines like Xanax and Valium are only prescribed for short periods of time but misuse during the prescription period can lead to addiction. They can cause “highs” and provide other pleasurable effects which can easily lead patients to misuse the drug and become addicted. 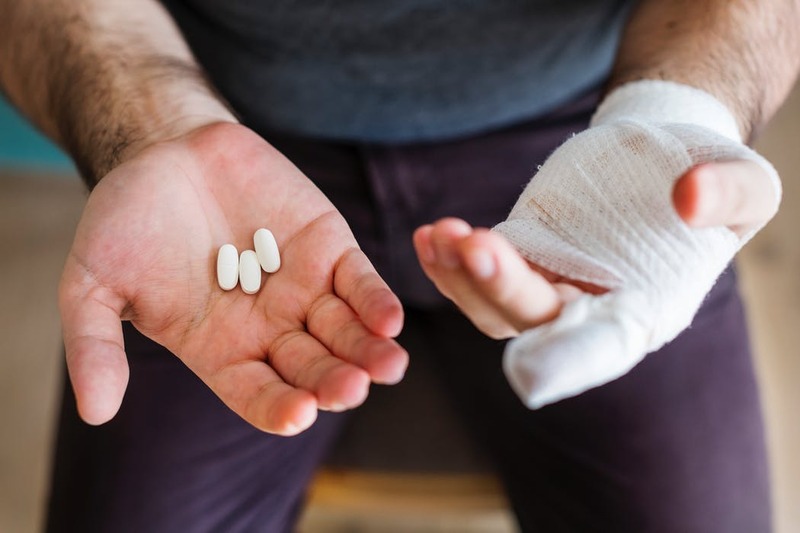 If you are trying to determine whether you or a loved one is addicted to prescription painkillers, then there are a few red flags to look out for. These include using higher doses of a painkiller than prescribed or for longer than the span of the prescription, changes in mental health, attempts to obtain prescriptions or black-market drugs, isolation and decline in social, professional and financial performance. There may also be physical symptoms such as dilated or constricted pupils, weight fluctuations and difficulties sleeping (these will depend on the type of drug). If somebody that you know is addicted to prescription painkillers, then you may want to discuss the problem with them as they may be unaware or scared of reaching out. It is important that you show your love and support and avoid blame or judgment at all times. You should listen to their concerns and encourage them to see a doctor who will be able to evaluate them and develop the best treatment plan (everyone reacts differently to different treatments). If you feel unable to approach someone or they are not getting the message, then you could speak to a professional and consider an intervention. The first stage of treatment involves withdrawal and detox. It is important to note that withdrawal from Benzodiazepines and other prescription painkillers is highly dangerous so you should never attempt to go through this “cold turkey” or without the presence of a detox medical professional – learn the dangers here. The withdrawal symptoms can be painful,and there are multiple stages that you will go through and it will take around 2 weeks for the drug to be completely out of your system. You will be given coping mechanisms to help you get through this difficult period. It is highly recommended that you find an inpatient rehabilitation treatment center to overcome addiction to prescription painkillers and this should be somewhere neutral and away from your home. The center should be somewhere to provides long-term inpatient care and customized treatment plans for each person. Most rehabilitation centers will provide a wide range of therapy and treatment to help individuals to overcome their addiction to painkillers. This could include Cognitive Behavioral Therapy (CBT), group therapy, individual counseling, family therapy, physical fitness, experiential therapy and holistic therapies. Overall, the treatment phase will address why you have misused the painkiller, the triggers for your drug abuse and skills and practices to minimize the likelihood of relapsing. How long this will take depends on the individual and their response to the treatments provided. Overcoming any kind of drug addiction is not something that anyone should have to do alone. It is for this reason why it is important to reach out to your loved ones if it is you that is going through the addiction or to be there for a loved one if they currently are. It can be a long and difficult road to recovery and there are sure to be difficult days where family and friends will be vital. This support could be anything from talking about the difficulties of addiction, providing a distraction, listening or helping with day-to-day chores. The treatment center should also provide an aftercare plan too as it will be a continuous battle once you have finished treatment. This could include ongoing counseling, alumni activities and ways to keep in touch with those at the center. Finishing treatment can bring a new range of challenges as it can be easy to fall back into old habits if you start to live your old life. It is for this reason why it is a good idea to remove temptation by ending toxic relationships and avoiding certain situations. It can be helpful to try new activities and hobbies, meet new people, attend sobriety groups and some people also find it beneficial to move home. Prescription painkiller addiction is a huge problem in the United States but also one which is widely misunderstood. If you or somebody that you know is going through addiction to prescription painkillers, then it can be difficult to know what to do and it is dangerous to attempt to treat this without a medical professional. Hopefully, the above information will help you to take the necessary steps to get the treatment that is needed so that you or the individual can overcome their addiction and lead a happier and healthier life in the near future.